Writing code and riding bikes. I just ordered one of these thanks in part to this review. I am really liking SC's new lineup with the longer cockpits -- a feature they have needed to implement for years prior. Thanks for the great review as usual, Vital. * Unfortunately, I cannot afford to buy cars new. That's a dang fine little video man; a worthwhile watch. I'm just stoked there's someone else in the world who also uses two forks to eat cake. Yeah, I love the level of bitching about "no 26." You know what a 27.5 fork feels like? It feels like a 26" fork that's one headset spacer taller. I am genuinely surprised by this; he's 6'3" and the reach for a large Myst is 440mm. That's his "I just finished a four pack of Monster and it's not even noon" face. If you've had the pleasure of meeting Evan, you know he works like a hummingbird. The copious Monster habit only enhances that trait. They did a really good job making a diverse track. This is going to be a great race. Who wrote that; Vital or Ibis? Because that's not true at all. Here's what QBP has as of tonight. Take your pick. Poor Issac, his clip got bogarted by JKW. Wait, are you really complaining about 3+ minutes of exceptionally good riding because it was produced by a brand you are angry with for being too expensive? As far as marketing videos are concerned, that one had a ridiculously good riding to product placement ratio. I'd say there were a dozen of townie firsts... no, bicycle firsts in that clip. Stand aside Danny MacAskill. That chart also shows the recommended number of tokens for each travel as red blocks. 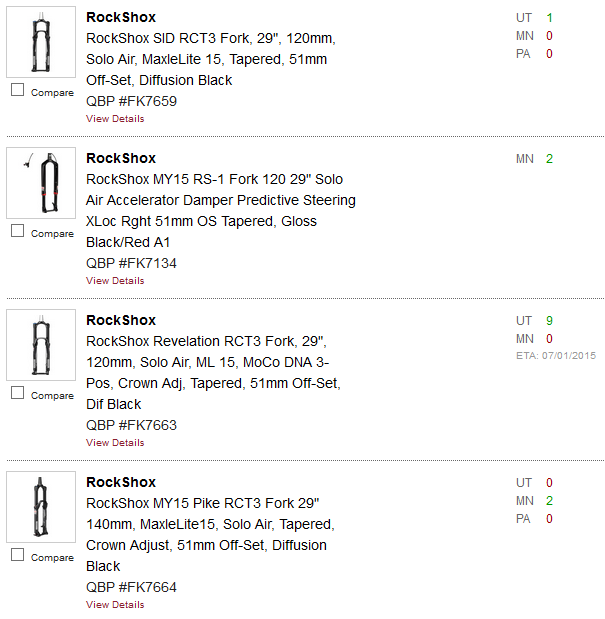 @tabletop84, RockShox suggests 0 tokens for your 26"/27.5" Pike 160mm. That's obviously not a rule, but a suggestion to help give you a baseline. I bring it up because if you prefer the feel of your fork with zero tokens, you aren't out of line. You can also chop the tokens in half if a full token is too much for you. That's what I did. I run 2.5 tokens at 87 psi on my 150mm Pike 29.
this kind of video is suuuuuuuuper. Keep them coming please! Brook has such an appropriate nickname. This is a good article and a good representation of the value of the Bottomless feature. This should enlighten a lot of folks who feel they can get more from their suspension. I want to add a pro tip: in slide #17 where the rider is using a socket to remove the top cap, that socket has had the chamfer on the inside edge of the socket lip machined off. If you use an off the shelf socket, the chamfer will prevent the top cap's hex from seating deep enough in the socket and top cap will be damage/stripped when tightened/loosened. If your socket has not had the chamfer machined off, use a wrench until the top cap can be turned with fingers. Pro tip #2: The negative chamber on Debonair shocks is huge and it does not equalize with the positive chamber until well into the stroke. So when Brandon advises cycling the shock a few times after filling it from empty, he means it. You will likely have to cycle the shock, add a lot more air (because the negative chamber took much of it), cycle again, add some air, cycle the shock, and then add air. By the third cycle (pun! ), you should be close enough to your desired pressure that you can just add air without the cycle, generally speaking. It takes me three cycles and fills from empty before the two chambers reach an equilibrium close enough to my desired pressure, even if I overfilled the first time, but I weigh a lot and run a lot of pressure. Also, these cycles can quickly be done on the shop floor -- no trail time necessary to get the two chambers to equalize. This slideshow has 35 comments. An unbelievable race perfectly captured! These slideshows are first class. Amazing work guys. Solid gold recap. And such a great race.